After World War I, Palestinians became a significant segment of Arab immigration to the U.S. The main reasons were the British occupation of Palestine and the subsequent creation of Israel. These events created thousands of Palestinian refugees and exiles who were dispersed throughout the world. For the first time, the rate of Palestinian immigration to the U.S. exceeded that of Syrian and Lebanese immigration. During World War I, the Arab governments sided with the Allies: Britain, France, Russia, and the U.S. They joined the fight against the Axis powers of the Ottoman Empire, Germany, and Austria-Hungary. Britain and France had promised to help the Arabs gain independence from the Ottomans in return for their support. Despite this promise, Britain and France signed a secret document dividing up Arab land. France took control of Syria and Lebanon and Britain established a mandate to rule Iraq, Jordan, and Palestine. This was the famous Sykes-Picot Agreement (1916), which divided parts of the Arab world into the countries that we know today. Additionally, Britain issued the Balfour Declaration (1917), which promised support for a Jewish homeland in Palestine. European Jews began to emigrate there. Palestinians feared that they would never gain freedom from the British, and that a Jewish state would form and end their quest for independence. 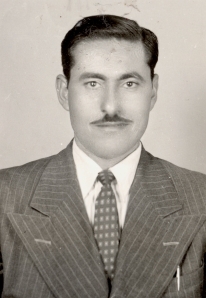 Resulting political and economic unrest led many Palestinians to come to the U.S.
Ahmad Ibrahim was born in Jimsu, Palestine in 1922. In 1948, he and his family were forced to leave their home and farmlands following the declaration of the State of Israel. They left behind their wheat mill and groves of fruit and olives, and fled to the West Bank, where they lived in a tent near Ramallah. As the weather got colder, they moved from town to town seeking shelter and work. Because of these hardships, Ahmad decided to immigrate to America. His wife Aisha had a cousin in Brooklyn who agreed to sponsor Ahmad as part of the Refugee Relief Act of 1953. Except for a necklace she received as a wedding gift, Aisha sold her jewelry to pay for her husband's travel to America. She sent the necklace with Ahmad as a gift for her cousin's wife in appreciation of their help. After arriving in Manhattan, Ahmad took a taxi to the Brooklyn home of Mossa, his wife's cousin. Moussa and his wife helped Ahmad start his work as a peddler of linens, tapestries, and blankets. Ahmad worked hard to support himself and send money to his family back home. Ibrahim family in 1960s-1970s. Courtesy of Ahmad Ibrahim. Key to a home in Palestine, pre-1948.